Cosmic Cow Pie: Connecting the Dots: Biker Dudes and H.O.G. Chicks Get Ready to Rally Williams Arizona! Biker Dudes and H.O.G. Chicks Get Ready to Rally Williams Arizona! The Harley Owner Group (H.O.G.) is going to partee! Be there or be square! It's time for the 2010 Arizona State H.O.G. Rally! Let the good times roll at the Arizona State H.O.G. Rally in Williams, Arizona! This annual tradition is coming back to Williams June 10th-12th 2010. The Arizona State H.O.G. Rally has quite an interesting history for those unfamiliar with H.O.G. Rallys. It's a great way to start the Harley summer fun at the Gateway to the Grand Canyon. Harley owners get together and RIDE...... A variety of Guided and self-guided rides will be offered throughout the rally dates. Some of the self guided include the following: The Grand Canyon loop, Sunset Crater loop, Oak Creek Canyon/Sedona just to mention a few. The Guided rides include: Jerome and Mingus Mountain, Route 66 through Seligman and Kingman for lunch at the Damn Bar Restaurant. Other destinations will also be available. All Guided rides will be led by Road Captains from the Grand Canyon Chapter and will follow the rules and philosophies of group riding as established by H.O.G. Pre-Registration has closed but there is still time to Register for all the fun! You can register on-site June 10th-12th. Registration will be at the skate park on both Thursday, June 10th from 10am to 6pm and Friday, June 11th from 8am to 6pm. Then on Saturday, June 12th registration will be at the Rodeo Grounds from 8am to 12pm noon. The registration fee is $42.00 for H.O.G. members and it includes: a Rally pin, patch, wristband, drawstring bag, and admission to all the activities. Guests may register for a fee of $48.00 and that includes: a Rally pin, patch and a drawstring bag. The guest policy is: "One (1) guest per H.O.G. member. Non-H.O.G. member guests may participate in most events. Guests will NOT be eligible for the NATIONAL drawing." And be sure to bring your National H.O.G. Membership Card to registration! The schedule for the Rally is non-stop excitement. It includes: live entertainment, Bar-B-Q's, guded rides, tours of Williams, street parties, a bike show, street dances, poker walks, and much more. The Williams-Grand Canyon Chamber of Commerce has been working with a number of local hotels and motels to obtain some great rates for the Rally attendees. When you call to make your reservation, be sure to mention that you're participating in the Rally. Each hotel or motel has it's own deadline to reserve your special H.O.G. Rally rate, so check into the deadline dates so that you don't miss out on the savings! 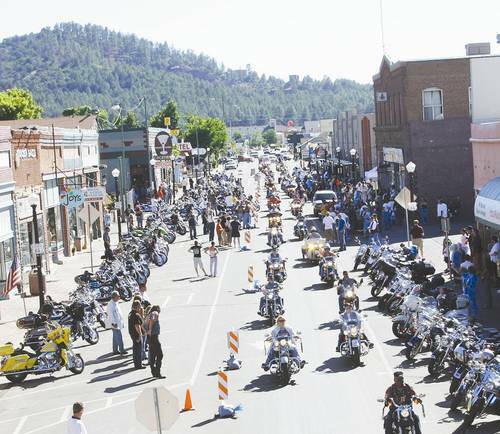 Come up to the high country of Williams, Arizona and enjoy the fun festivities! You can even fill out the application to become a Vendor at the Rally, but the deadline for applications is May 21st, 2010 so don't miss it. Contact the Arizona State H.O.G. Rally at 602-995-2658 for more information. No better way to partee than with bikers! Truly an experience!! I think it would work, Carra!!!! Lori ~ Do you bike... come on over! I saw your tweet this morning.. fun.. loved your man cave post! I will go tweet your post. Gene~ You are one funny guy... actually a friend of mine is a REAL biker Chick.. has about 7 Harley's so I guess I could sit on one and do a flip cam video.. great idea Gene.. we will go with that one! I used to ride a Yamaha to work at 16 when I was a life guard.. does that count? Carra - you have beautiful territory to ride in, I've been there 3 times. Jerome and Sedona are my favorites. And of course the Grand Canyon, but we could only stay there 15 minutes. A sleet storm chased us all to the way down to Lake Powell. Cynthia ~ It is beautiful country.. let's have a meet up if you come back this way.. I can work on ordering you good weather! Carra - will do ... except the next time I might not be arriving on a Harley. I'm getting a little too !gasp! old for that! Ooo, Carra Mia on a Hog! Video PLEEEZE! I always enjoy the biker events, and the last time I was on a bike I was in my teens and crashed. Still got the scar on my chin. But the bikers are GREAT. And the best clients too! Hi Carra - Since I live on in a community right off Route 66, I got to see them thar Hog Riders first-hand. It was a perfect day for a ride. Ok the Biker Banana's are suited up and ready to rumble with the best of them! Sure do wish I could make it. I go to the rally here every year. There sure is a lot of fun to be had by one and all. Carra, I am forwarding this post to my friend in SC in case she doesn't know about this event. I had to google poker walk to find out what it meant. LOL. But what if you had all low cards? Who would trade with you? Carra: I've actually had Marilyn working on the idea of a "run" ... but instead of restaurants or bars to stop at ... it would be real estate professional's offices. You know ... title company, lawyer, mortgage company, agent, inspector. I think it could be fun on a summer night and get everyone on the "team" exposure. I think my wife thinks I'm a bit nuts ... but we're still working on the idea!! What do you think???? Will it work???? Carra ~ How much fun is that?? Sounds like another really good reason to parteeee in Williams. How do they get along with the Mountian Men? (Probably most of the same group)!! Cynthia~ Oh no... there are a lot of total gray haired pony tailed men and women I see on the streets of Williams riding and having a great time.. But I understand.. my neighbor has a Harley Trike... now the two don't seem to go together but at least she won't fall over! Candyland ~ .. no riding for me.. too scary... too big... I can video from the back seat of a Harley in the parking lot looking at everyone else... that is the extent of the Harley ride for me. :) Cosmic Chicken! Ms Pam~ I think there are a lot of Harley rides on Rt. 66... this one in Williams won't be till June 10th through the 12th.. you and Tony should come on up! Anna~ Biker Banana's Now that would be a site.. I would like for you all to come up and wear those suits at the HOG Rally.. now that would be a video.. I know the bartender in the World Famous "Sultana" biker bar.. I am sure she could set up a media event for us! I will treat you all to a bbq in my back yard! Dawn ~ No leathers for me.. won't skin my legs if I don't get on the bike! Now Candyland might have a set.. might wear them on her DJ Shows for bounce radio! Dale ~ woo hoo.. that bike is HOT! You should do some posts about your biker events! I think many people are addicted to Harley events! Rebecca ~ Now that would be an AR story.. we have plenty of room so if she comes we can have a meet up.. wow that is a long ride from SC to AZ.. one TB maybe you could ride on the back with her???? Elizabeth ~ We have it all in Williams including poker walks! When we lived in Lake Havasu, AZ they had an annual poker run on the lake with VERY Fast boats.. good times! Gene ~ IT will work.. we actually had one for Real Estate in Lake Havasu.. I will look through my stuff and see what I can find.. it was lots of fun and worked perfect.. got cards at each of the stops just like you identified. I helped someone in Denver do one after the experience in Havasu.. the Denver Group did it in one office real estate office and it was at open houses of their listings.. so the concept will work.. did you google it.. and see? How fun! I have another idea for you Mr. Gene.. with a live stream webinar with power presentation and view of the presenter recorded for consumers to compare lenders... call me when you can.I have a great idea to EMBRACE the new HUD regulations upfront to help closings go better at the end. Ken ~ you are funny! The Williams Mountain Men.. like ANY people coming to their community.. so they embrace the events with open arms! You should make a plan and come up an party.. you can check in at the Cosmic Cow Pie Computer Cave on foursquare! Hi Carra, sounds like a lot of fun for the entire weekend! Thanks for the invitation, Carra. It sounds like a great time! I think Anna Banana's group ought to show up in their banana suits riding hawgs. Jackie ~ I will be there to video blog about it.. so will keep you posted! Pam ~ Anna said they wore them to the opening of a Harley store in Phoenix.. hence the photo! I hope those are the really noisy bikes that you can hear coming from about ten miles away. That could get really noisy. Blue Martini Phoenix is a trendy, upscale lounge with a 'locals bar' mentality. It features the best in Live Entertainment in Phoenix.